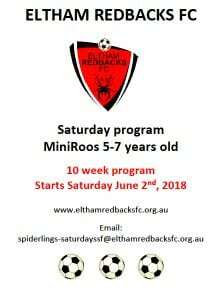 Have you driven past the Redbacks recently on a Saturday morning? Has your child seen all the players in their kit running around the pitch & wanted to join the fun…well they can! Just announced, is a mid-season intake of players born in 2011, 2012 & 2013 – commencing June 2nd. Limited places available (mainly in the u6 & u5 age groups), contact us for more information.